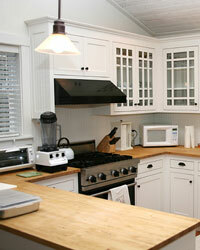 Butcher block countertops bring the warm beauty of natural wood to your kitchen. Whether your style is contemporary, traditional, or rustic, wood countertops will enhance your decor. Butcher block countertops are usually custom made. They may have knife slots, integrated drainboards, or various inserts to land hot pots and pans. When mixed countertop surfaces are used in a kitchen, a custom butcher block countertop is frequently used on an island as an accent. Or a piece of butcher block may be used as a small segment of the countertop for a place to cut and chop without ruining your knives. If marred by sharp blades, the wood can be sanded and refinished. Butcher block countertops are made from strips of wood laminated together. The wood is laminated as face up, edge up, or end-grain up. Most butcher block is edge-up laminated. The pieces of wood are glued and clamped and put under heat and pressure, which makes the butcher block strong, warp resistant, and water tight. Sometimes multiple wood types are mixed in stripes side by side to show different color designs. The result can be striking. Hard rock maple and red oak are most frequently used for butcher block countertops in a working kitchen. Walnut, cherry, teak, or other woods may be used for decorative surfaces where no cutting will occur. Use a non-toxic, penetrating oil such as food-grade mineral oil or a professional grade wood sealer designed for food surfaces to treat butcher block used for food preparation. Oil will have to be re-applied frequently. Decorative surfaces can be finished with varnish or urethane. Wood is a porous material. 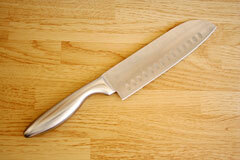 It can trap food particles, so clean your butcher block countertop thoroughly after each use. 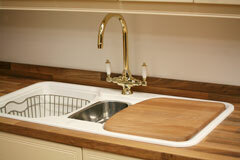 Wood countertops may warp and discolor if used near a sink or wet area. They are also not heat resistant. The best solution may be to combine them with other countertop surfaces. Despite these drawbacks, you may decide that butcher block is the look for your kitchen; and with proper care, these countertops offer elegance and sophistication. Browse through the following manufacturer sites. Choose a wood type, an edge profile, and a finish; and after it's installed, your butcher block countertop just might prove to be the real focal point in your kitchen! 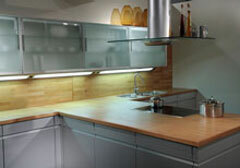 Hardwood Lumber manufactures solid butcher block countertops in a variety of hardwoods. They also offer other hardwood products such as stairs and mouldings. Butcher Block Co offers a good selection of butcher block counters, carts, islands, and tables. Shop for kitchen butcher blocks by size, style, and finish. Devos Woodworking is a Texas-based company that provides butcher block countertops, kitchen island tops, and bar tops, as well as cutting boards and other custom wood items. Each piece is custom designed and handcrafted.